Poets were some of the most important people in the courts of the Timurid kings. They were not only artists; they had enormous power to influence the king and to ultimately write the history of centuries. So they want to entertain the king and tell him happy stories about how beautiful the spring is and how wonderful his lands are and how wonderful he is. And then he gives them money. This is a job. To be a poet at this time was a major career. We know, for instance, that the Shahnameh, the book of Kings, the Persian national epic, was presented to Machmud, and there was a contest with different poets. And we have depictions, much later, of course, showing the competing poets. So it was sort of like winning the Nobel Prize for poetry. The Shahnameh, which was written by the poet Faradose, around the year 1,000, finished about 1010, was, is a 50-thousand couplet poem, recounting the history of Iran and the Iranian world from its mythical foundation up to the Arab conquest in the 7th century. [...] It is the classic work of Persian poetry, somewhat comparable to the Iliad or the Odyssey in the Western tradition. And as Persian language spread through the region, so did its poetry – and through its poetry, its culture and its values. All of Iran is spreading eastward up to the Oxus of what is today Afghanistan, and across the Indus Valley through what is Pakistan and into India. So all this area is speaking the Persian language. And, the stories show how the kings related to each other and paid tribute, and the heroes would defend the borders. So you have the great stories of Rostam and how he defends the king. And the questions of loyalty to the king and loyalty to the crown, and how is a hero supposed to treat a tyrant king who is sometimes wise and sometimes not. What we find here is that the poetry is a treasury of all that matters in a culture both for an individual personally and spiritually, and socially how should you act in your career, in your life. How should you act politically? What are the values of standing up to a king or being quiet? And how should a people get along together, and how should a people get along with others? So the reason this literature and these poems have lasted for a thousand years is not because there’s some kind of declaration. They are fundamental values and they are a mirror of society. The stories of the Shahnameh are ancient, but they live on today. So these stories of love and fighting and standing up for what is true are repeated over and over again, and the reading of the Shahnameh is a very heroic rhythm. It’s tah-dum-dum, tah-dum-dum, tah-dum-dum, tah-dum. Tah-dum-dum, tah-dum-dum, tah-dum-dum, tah-dum. So this recitation is a live tradition also today. So for over a thousand years these stories of Ferdowsi’s Shahnameh have been memorized, performed and loved. Children are named for the characters, boys and girls, in the Shahnameh because it touches ancient, ancient roots and values. And that’s what poetry and literature gives us is that it touches what matters most to us in life. 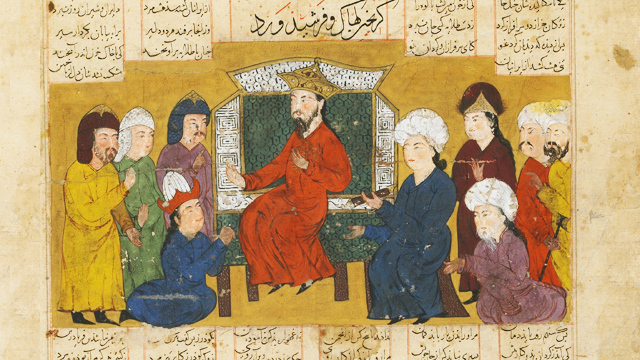 The history of Persia, told through epic poetry.